A frequent question we answer is whether solar panels can be mounted on carports. While anything is possible, the end result is often that the carport is not a sufficient enough structure, or building one to support solar panels would be cost prohibitive. This question is usually asked about existing carports in Southwest Florida. Since these structures are usually built with cost efficiency in mind, they do not have the required uplift capacity to resist wind to the same extent as occupied buildings. The weight is not typically a concern, but wind resistance is, especially because these are open structures. 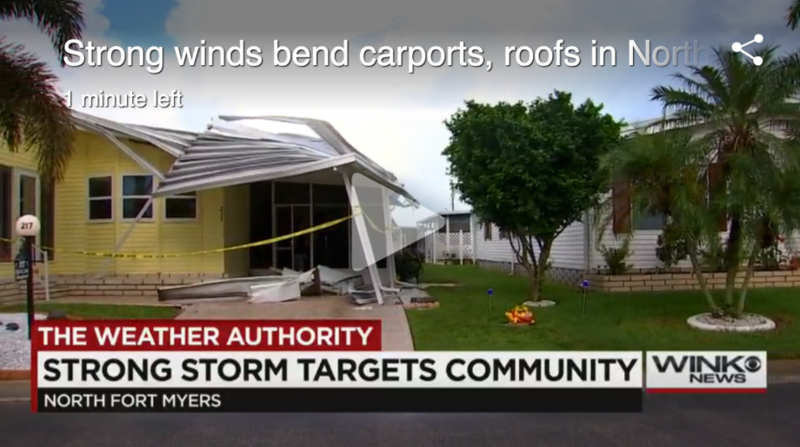 This was demonstrated recently in Cape Coral where some carports were severely damaged by a wind event not associated with a hurricane or tornado. While this may have been a freak event, it is precisely why building codes exist that generally prevent adding solar panels to an existing carport. New carports can certainly be built to different standards that would support a solar panel installation. The added cost of beefing up the structure to resist high winds often proves to be pretty expensive once people start investigating the option. We don’t design or sell solar carport structures, but if an engineered carport is being installed by a client, we can advise them on the requirements and help their architect or engineer ensure that the structure will be sufficient. Beware – many of the solar carport kits you will find out there are not designed to the building codes and wind uplift requirements we have here. So why is this such a popular subject? What we hear most often is that people either don’t want to see solar panels, or they are concerned about roof leaks on their home. The first concern is understandable, but solar panels are so common in Southwest Florida, there is little reason to worry. As far as roof leaks go, a properly installed system will maintain the integrity of your roof. Just make sure your installer is well qualified, uses proper hardware and flashings, and maintains liability insurance well above the state minimum. Whether you are considering a solar pool heater or solar electric system, we can advise you on your solar panel carport questions with respect to our local conditions here in Southwest Florida. Contact us today for more information.